Serious gamers know that one of the most important parts of the gaming experience is having the right gaming television on the right TV stand. All of the components of the gaming system, including the game systems, controls, receivers, and other peripheral components should be organized and stored securely. The right gaming TV should have quicker processing speed, a fast refresh pace, and a specific mode for gaming. 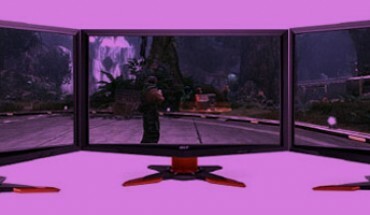 A gaming TV is made to accommodate the requirements of one gaming system or many. The stand for a gaming TV and the accompanying systems needs to be aesthetically pleasing but also able to accommodate the needs of the avid gamer. The best thing about gaming today is that much of the equipment and furniture that is designed with serious video gamers in mind because of the growing popularity of advanced gaming. With interactive gaming, online gaming and graphics and details that mimic 3D and live technology, the demographic that is gaming regularly is changing and growing to include people from all ages. Speakers, headphones, seats, displays on televisions and desks are being designed with the comfort and ease of the gamer always at the forefront. Gaming TV stands are also being uniquely customized as well. The best TV for gaming will have as many ports as possible for the various systems that it will accommodate. The stand that will hold the television should also have convenient places for the systems as well as plenty of available space to connect all of the wires and accessories. This will allow for easy switching between games or between sessions without the interruption or aggravation of inconvenient rewiring, replugging, etc. And, as any serious gamer knows, the more ports and openings, the better and more organized the gaming experience will be. 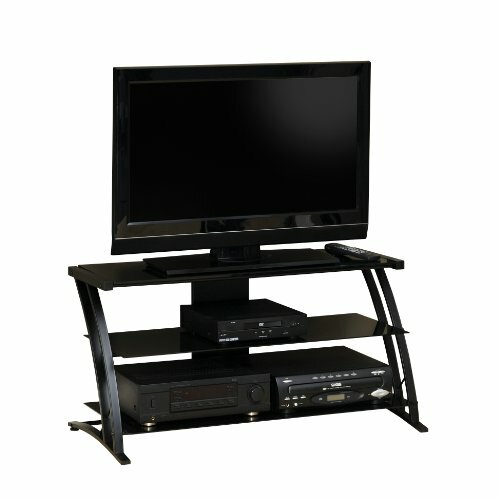 The stand should easily accommodate all of the systems and the television. The TV stand that you will choose for your gaming experience should also take into consideration the type of television that you are using as well as the size of it. A smaller television may have fabulous graphics and all of the ports that you need so your stand shouldn’t be suited for a television that is three times its size. Not only will it look wrong, but the smaller television will probably not fit adequately on a large stand. A lot goes into a good gaming TV stand. It has to be big enough to fit your TV, console and peripherals, but not so big that it is difficult to fit it into your bed room or game room. It should also provide good storage space for games and wrangle all the wires into a nice easily-managed and aesthetically-pleasing bundle. We put the most popular gaming TV stands to the test and compiled the ten best contenders. 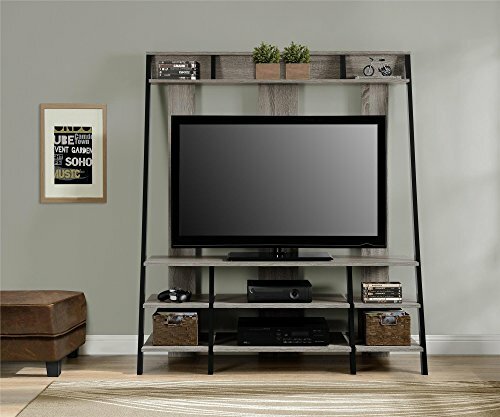 The Walker Edison Wood Corner TV Stand comes highly rated, and while it may not be the most aesthetically pleasing piece in this list, it is certainly one of the most functional and strong. 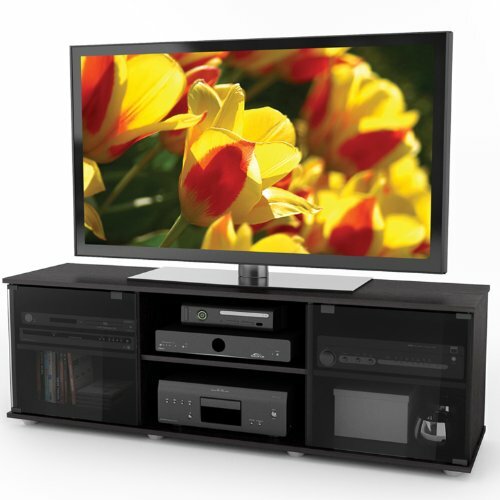 It is claimed that the WE TV Stand can hold up to 250lbs with its sturdy MDF construction. We didn’t put that weight limit to the test, but it does hold a 60 inch TV very comfortably with not even a hint of sag. There is ample storage with 4 compartments, each with their own cable access hole for a tidy setup and each large enough to store a console or media box or a selection of games. The size of the bottom two compartments is larger than the top two making them easier to store games for the likes of the PS4 or Xbox One. 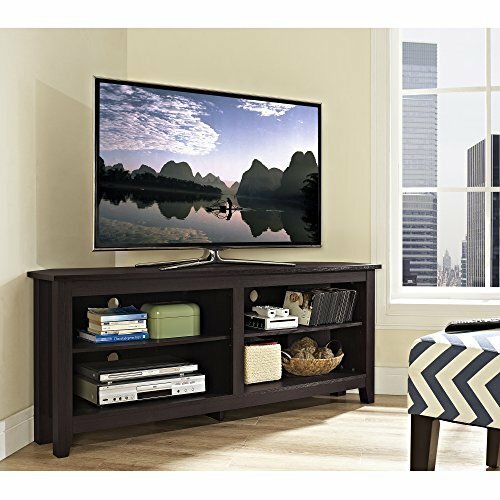 If you are looking for strength, ample storage and a simple, tidy and functional TV Stand, then you could do far worse than the WE Wood Corner TV Stand. This Altra Dunnington entertainment system centre is designed in a ladder style on several levels, with a sonoma oak finish. The ample storage is ideal for safely storing all your gaming systems, controllers and plenty of games. The frame is a little restrictive in terms of the TV size that it can handle, but with a capacity of 48 inch screen and 70lb in weight it is a suitable candidate for most. The design offers a modern centrepiece to any living room or gaming cave. Sauder’s other entry in the top ten, the Deco is a multi-purpose shelf like the Proforma. It lacks a lot of the gaming-specific features that make the Booster stand out, but it covers a lot of its drawbacks as well. It is more compact and much sturdier and makes very effective use of its space. It would be the winner of the multi-purpose category if it featured a swivel option like the Proforma. Another excellent multi-purpose option that can fulfill both gaming and non-gaming needs, this compact stand maximizes available space with a wall-less shelf design. It also features extended “wing” shelves on the top and bottom tier that can be used to hold games or consoles. It loses points for poor wire control, so invest in plenty of zip-ties. The Centipede is Atlantic’s counterpart to the Sauder Booster. Unlike the Booster, it is much more compact and is constructed of sturdy steel wire. Featuring controller racks, specialized storage areas for games and hooks for headphones and peripherals, it has all the gaming-specific features you could want. The only downside to this stand is the overall lack of storage space. With three consoles on it, there is little space for anything else. 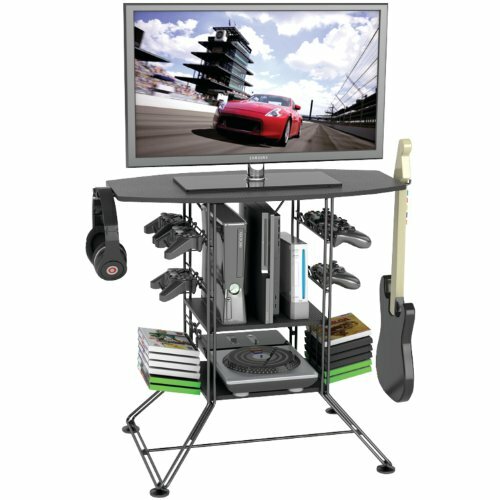 It is good for a gaming area, but if you intend to use the TV for anything else, you will need a bigger stand. Like the Centipede, the Spyder is designed exclusively with gaming in mind. Unlike its larger cousin, it holds only two controllers and just six games, but it offsets this with a big feature – a swivel mount. The Spyder’s swivel mount features a full 120 degrees of rotation and is height-adjustable between 22 and 50 inches, which means great visibility from anywhere in the room. It’s perfect for party games, but dedicated gamers may find themselves running out of storage space rather quickly. Altra’s Galaxy stand has several advantages that separate it from the rest of the crowd. 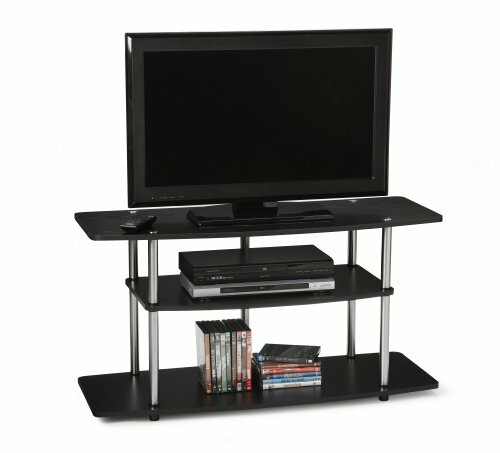 It can hold TVs of up to 50 inches on its stand, giving it the best TV-size to stand-size ratio of all ten contestants. It also features an ingenious storage and wire management system in its central column. This gives it the best wire-management score out of all the stands on this list. In addition to that space, it also has two shelves. One downside to the stand is the lack of structure on the shelves, making games or consoles easy to knock over. To make the issue worse, the top shelf is glass, which could make an angry controller throw very expensive. The Altus is a unique outlier on this list since it is not actually a TV stand. It is a wall-mounted audio-video console. While it could be inconvenient to install, it offers incredible flexibility since it can be combined with a number of other storage solutions. 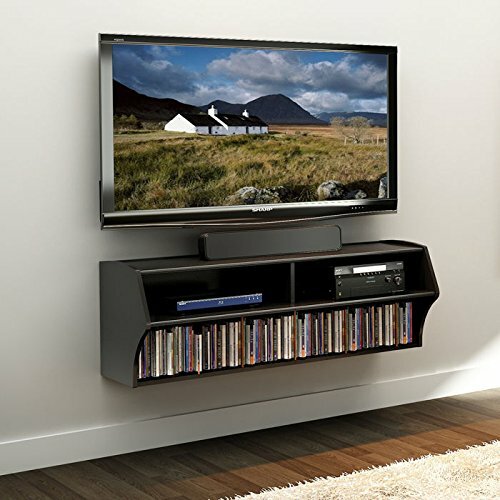 The structured shelves and wire runners likewise make it an excellent storage solution for a wall-mounted gaming TV. The downside to the Altus is the low height of its shelves. It is impossible to fit any console other than a GameCube upright, and it would take a Tetris master to fit more than two on their side. However, if you are only using one console you could easily fit it on the top shelf with a DVD player and a set top box, leaving the entire bottom shelf for games and movies. Do you have a TV bigger than 50 inches? If so, the Sonax if your TV stand. It is by far the biggest TV stand on the list and is designed to hold the biggest TVs. In addition to that, it features two enormous storage shelves, glass doors and internal wire-runners. It can hold all of your consoles, controllers and accessories and have room to spare. The only disadvantage comes from its size. It will take up quite a bit of real estate in any room where you would put it. Our final entry is by far the best looking one on the list. Made of solid wood with beveled glass doors and burnished handles, it simply oozes sophistication. While Atlantic stands look like high-tech toys and Sauder’s other entries are rather utilitarian, the Palladia looks like what the Queen of England puts her TV on top of. While its use of space is not as effective as some of the other stands and it does not have any gamer-specific storage options, it is far and away the most stylish. Some of the more common questions that you should ask might include whether or not the stand will be mounted or if the television will sit on top. A good gaming TV stand will also have plenty of storage space, both open and behind easily accessible compartment doors. What is the decor that the stand will accompany? Style is definitely a concern. A good stand shouldn’t just be functional – it should also be aesthetically pleasing. Consider the size and the layout of the room where the stand will be. It shouldn’t crowd the other parts of the room but should fit in nicely as an addition to the room’s features. 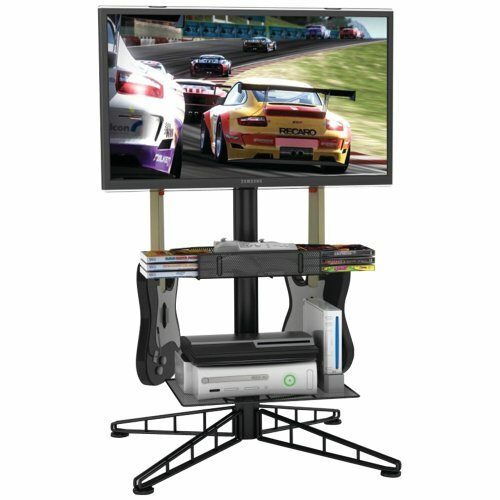 There are different styles of gaming TV stands as well to suit every gamer’s personal preferences. For a modern, open appearance, there are several different varieties of wire stands that are affordable as well as simple to set up. These stands are usually smaller but have tons of storage space and are easily changed when new consoles are added, additional accessories are added, etc. They will usually accommodate televisions of many different sizes as well so they are flexible as well as durable. 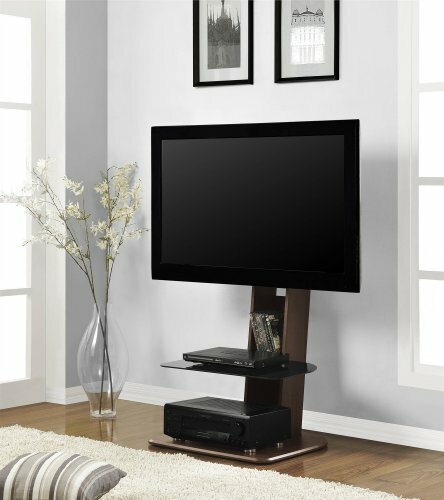 Console TV stands make maximum use of smaller spaces because the design is compact. A console stand is great for smaller, more informal spaces like bedrooms or game rooms. These are also great in family rooms where many different ages and tastes are being considered. Entertainment centers are great as center pieces or main focus areas and will accommodate many different items, including stereos, gaming systems, and even books and keepsakes. 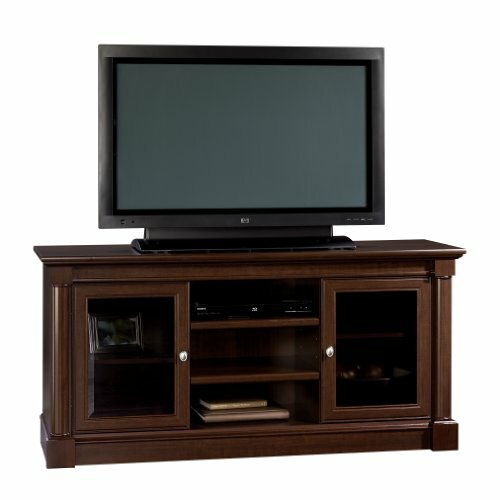 A beautiful entertainment center is a welcome addition to any living room or family game room. As with most home furnishings purchases, the style and kind of gaming TV stand is limited only by the imagination and preferences of the gamer. Whether a part-time or serious gamer, the right TV stand will make a tremendous difference in the overall experience. The most important attributes to consider are ease of access and adequate storage space but the aesthetic features of the stand are also important. No matter which TV stand you choose, make sure that the stand is perfect for your needs! Gaming Monitors vs Gaming TVs – Which is Best?